Abul Hasan Hankari (Arabic: ا بوالحسن ہنکاری‎‎) Abu Al Hasan Ali Bin Mohammad Qureshi Hankari (born in 409 Hijri, in the town of Hankar), town of Mosul (city of northern Iraq, some 400 km north of Baghdad), died 1st Moharram 486 AH (1 February 1093 C.E), in Baghdad, (1077–1166 CE), was a Muslim mystic also renowned as one of the most influential Muslim scholar, philosopher, theologian and jurist of his time and Sufi based in Hankar. He got education from his father. He was a man acquainted with the hidden secrets and was known for his Karamats. He would fast for 3 consecutive days and complete 2 whole Quran between Isha and Tahajjud. He devoutly stayed in worship day and night. He had the habit of practicing excessive religious exercises and recitals. He traveled across many countries to get religious knowledge. From Rome to Spain to Harmain, etc. he met numerous scholars and shaikhs from whom he began to receive instruction in Fiqh and muhaddiths from whom he memorized ahadith by heart. He even met Shaikh Abu al-Layla Misri and heard hadith from him. All Hafiz (memorizers of Quran), Muhaddiths (narrators of Hadiths), Qaries (reciters of Quran with correct accent and pronunciation) are given a chain of credible narrators linking to the Islamic prophet Muhammad. He gained exoteric and esoteric education from the most prominent and influential scholars of his time. He even got spiritual beneficence from Bayazid Bastami. After sometime, he went back to his homeland. Hence, the people around him gave him a lot of respect and he gained fame. He earned the title of Shaikh-ul-Islam due to the unmatched religious knowledge and beneficence of the time. Countless seekers of Allah benefitted from him as he was an Arif Kamil. He was the Imam of Shariat and Tariqat of his time. He wore the khirqa of khilafat from Mohammad Yousaf Abu al-Farah Tartusi who was the Qutb of that time. The period between the 11th and 14th centuries is considered to be the "Golden Age" of Arabic and Islamic philosophy by the Stanford Encyclopedia of Philosophy, he has an important role to play in it as he was one of those early Sufis who brought logic into the Islamic seminary. Abul Hasan Hankari was the descendant of Mohammad's paternal uncle: Abul Hasan Hankari son of Shaikh Mohammad Jaffar son of Shaikh Mohammad Yousaf son of Shaikh Mohammad son of Shaikh Umar Sharif son of Shaikh Sharif Abdul Wahab son of Abu Sufyan Zaid son of Haris son of Abdul Muttalib son of Hashim. His descendants later spread to the State of Bahawalpur, Azalah, Jhang, Gujranwala, Sialkot, Faisalabad, Lahore, etc. The Murshid of Shaikh Abdul Qadir Jilani, Abu Saeed Mubarak Makhzoomi spent 18 years at the service of Abul Hasan Hankari and led the silsila after him. He died on 1st Moharram 486 H, 1 February 1093 CE during the Abbassid Caliphate. 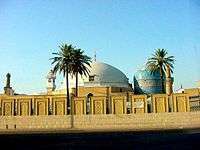 His shrine is the village of Hankar, Baghdad. ↑ The works of Shaykh Umar Eli of Somalia of al-Tariqat al-Qadiriyyah. ↑ W. Braune, Abd al-Kadir al-Djilani, The Encyclopaedia of Islam, Vol. I, ed. H.A.R Gibb, J.H.Kramers, E. Levi-Provencal, J. Schacht, (Brill, 1986), 69. ↑ Muhammad Riyaz Qadri, Abd al-Qadir al-Jilani. Mystical Discourses of Ghaus-e-Azam. Abbasi Publications. ISBN 9789698510213. ↑ Names, Tawassul of Qadiriyya. "The spiritual genealogy from the Prophet Mohammad till Shaikh Abdul Qadir Jilani". ↑ Francis Burton, Sir Richard. Lineage of khilafat from Shaikh Abdul Qadir Jilani to Muhammed (Personal Narrative of a Pilgrimage to Al-Madinah & Meccah, Volume 2). Courier Corporation. ISBN 9780486212180. ↑ Tony Street. "Arabic and Islamic Philosophy of Language and Logic". Stanford Encyclopedia of Philosophy. Retrieved 2008-12-05. ↑ Burton, Richard. Specimen of a Murshid's Diploma, in the Kadiri Order of the Mystic Craft Al-Tasawwuf. ↑ Riyaz Qadri, Muhammad. Ilhamat-e-Ghaus-e-Azam : Hazrat Shaikh Syed Abdul Qadir Jilani (R.A.). Abbasi Publications. ↑ Francis Burton, Sir Richard. Personal Narrative of a Pilgrimage to Al-Madinah & Meccah, Volume 2. Courier Corporation. Lahore, Pakistan. ISBN 9780486212180. ↑ Mohammad Najib ur Rehman, Hazrat Sakhi Sultan. Sultan-Bahoo-The-Life-and-Teachings. Sultan ul Faqr Publications Regd. ISBN 9789699795183. ↑ "Ghazali, al-". The Columbia Encyclopedia. Retrieved 17 December 2012. ↑ "Avicenna (Persian philosopher and scientist) – Britannica Online Encyclopedia". Britannica.com. Retrieved 2012-01-07. ↑ Gibb, H.A.R. ; Kramers, J.H. ; Levi-Provencal, E.; Schacht, J. (1986) [1st. pub. 1960]. Encyclopaedia of Islam (New Edition). Volume I (A-B). Leiden, Netherlands: Brill. p. 1130. ISBN 9004081143.